The Texas Department of Transportation (TxDOT) will continue replacing the bridge deck on I-45 this weekend in Montgomery County. Closures will be similar to the last closures, but this time it will occur on the southbound side of I-45. 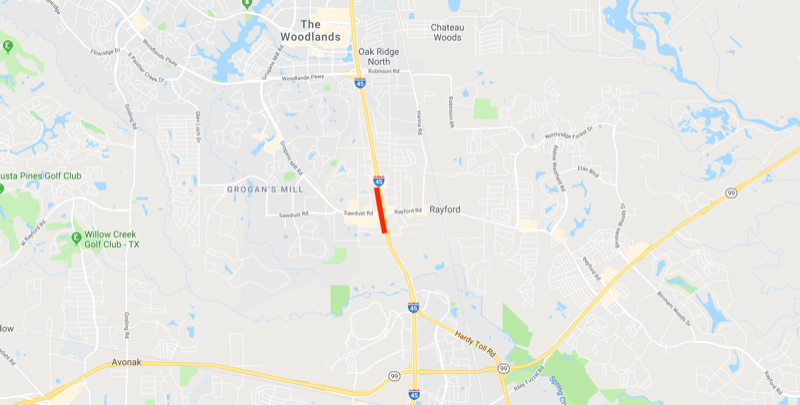 There will be a total closure of I-45 southbound mainlanes at Rayford/Sawdust Road starting Friday, January 25 at 9 p.m. and ending on Monday, January 28 at 5 a.m. Drivers will detour the closure by exiting I-45 southbound at the Rayford/Sawdust exit and re-entering the freeway at the next entrance ramp, just south of Rayford/Sawdust Road. There will be police officers at the intersection directing traffic. The U-turns at the Rayford/Sawdust Road intersection will also be closed from Friday, January 25 at 9 p.m. to Monday, January 28 at 5 a.m., but drivers will be able to drive under the freeway on Rayford/Sawdust Road. The Woodlands Parkway Direct Connector from Woodlands Parkway Eastbound to IH 45 Southbound Mainlanes will also see a total closure Friday, January 25 at 9 p.m. to Monday, January 28 at 5 a.m.
TXDOT is asking drivers to avoid this area if possible during this closure and to continue to be cautious when driving near construction zones. All closures are subject to change due to inclement weather.